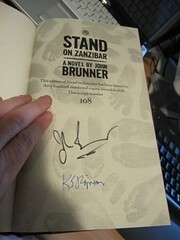 Stand on Zanzibar by John Brunner – Centipede Press edition limited to 300 copies, each signed by John Brunner and Kim Stanley Robinson. The Martian Chronicles: The Complete Edition by Ray Bradbury – Subterranean Press edition, 500 signed numbered copies. Codex Seraphinianus – 25th anniversary (and much cheaper!) edition. and I can comfortably go on, nevermind my Captain America and Sandman special editions. One of these days I shall photograph and document all my nice books. However, as I say, my most expensive book was bought while on the dole, and I’ve never regretted that purchase. Nor have I spent more either. I don’t know why, perhaps my passions have changed, or I have more things available…particularly my desire to travel. Perhaps too, in order to spend more can mean spending a lot more…which I don’t want to do. There’s been a few things that have cropped up here and there such as a leatherbound edition of the OED (a mere US$6k), or the Chinon parchment, published by the Vatican archive (US$8k) that have piqued my interest but not sufficiently so to part me with my cash. Thankfully! Codex Sinaiticus is one of the world’s most remarkable books. Written in Greek in the fourth century, it is the oldest surviving complete New Testament, and one of the two oldest manuscripts of the whole Bible. This edition is a unification of the text that is spread across 4 major archives, with no one institution holding a complete version. I first came across this a few years ago when I was in London and visiting the British Library. At the time they had a public display about the Codex which whet my interest. Of course, there’s now a website devoted to it, and I was interested to see that they’ve published a printed edition. However, the item that really inspired this particular chain of thought, and is rather tempting for a bunch of reasons including its format, is the Scroll of Esther. Published by Taschen, who generally known for producing large, fascinating art books of which I have a few. This work is a full facsimile based on the 1746 Hanover Scroll of The Book of Esther including colourful illumination. It is a single sheet measuring around 6,5 metres, unfurling from a leatherbound cylinder. Limited to 1,746 copies and will retail for GBP450 when it’s released in a couple of months. I have a soft spot for illuminated manuscripts though it’s not a point of collecting for me unless it’s sufficiently unusual. In addition, a big attraction of this is the scroll format; I think I have a scroll or two already but nothing on par with the majesty of this. I came across it a day or two back and it’s stuck in my head…it might actually be tempting. Interesting to compare prices via booko with prices already ranging from Oz$572 via Book Depository to Oz$1,042 via local retailer Angus & Robertson. I am going to cultivate our friendship further, visit you in Oz and steal that Stand on Zanzibar. I still think it’s a good plan at least as far as people visiting exotic Orstralia being gotten drunk on good port and whisky. The book’s removal or otherwise could be a stretch objective for us both.